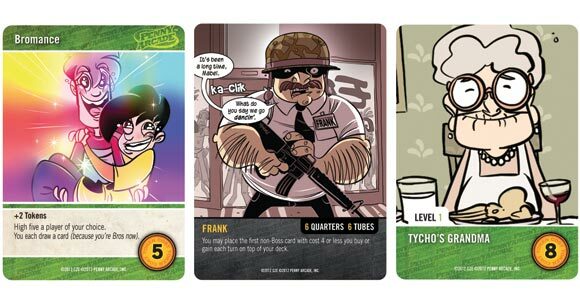 Penny Arcade: The Game, Rumble in R’lyeh is a complete game, but it's also an expansion to the hit deckbuilding game of 2011, Penny Arcade: The Game, Gamers vs. Evil. Players can easily mix the two sets together for the ultimate crazy ride through the sublimely bizarre world of the Penny Arcade web comic. Explore Gabe's Gross Mouth, harness the dubious power of Bono Trask: Timesqueezer, and fall under the curse of TouchWeiners' dark double: the Were-Swan. Cryptozoic really didn’t waste much R&D on this game. They essentially took the game elements of Dominion and Ascension and mashed them together with the Penny Arcade Universe. That being said the game plays incredibly well. I’ve often argued that Dominion really forces everyone to rush for the best cards/strategy and Ascension has huge balance issues. Rumble in R’lyeh plays with good pace and the character cards give each player a strategy to strive for. Despite it’s median review I thoroughly enjoyed this game and would recommend it to other players who recognize the design flaws in Dominion and Ascension. This game is a great addition to the original. It helps add in much needed excitement if you have played through the original a bunch but it seems to play pretty similarly each time due to it only having one boss of each type. If you combine it with the original it is an awesome deckbuilding game. And the gold cards really do add something new. but the game still ends sooner then I would like unless people specifically allow the game to extend. 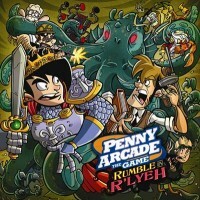 Add a Review for "Penny Arcade: The Game, Rumble in R’lyeh"